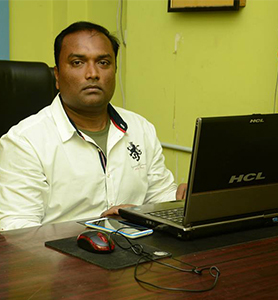 An entrepreneur for more than a decade, Anand was previously running Social Media Marketing Company handling accounts of many leading brands and consult them based on requirement. He holds Mechanical engineering degree from Karnataka University and has worked with few multinational companies on implementing their support & back office operations. With his expertise on Back office outsourcing, he was able to setup large teams on various outsourced projects both domestic & International. Very passionate about cooking, baking & have attended numerous workshops on them but he still struggles to prepare a decent dish. His plan& dream is to establish world class training centres for Baking and related products all over the world. 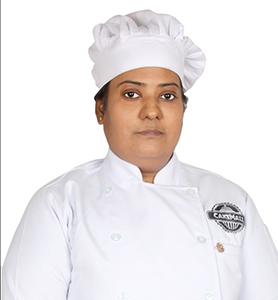 With more than 18+ years of experience in Baking Industry, Uma is named by her colleagues as Great Wall of Baking. Extremely passionate about baking, you can find Uma almost at every baking event. She is master in baking Breads, Desserts & Puff Pastry. 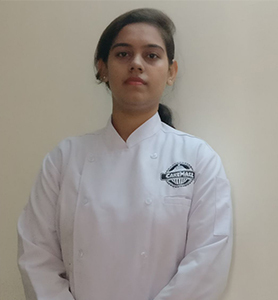 Extremely innovative in creating new recipes, Uma is a hotel management graduate from Asan Memorial catering college and have served quite a few big brands in the baking industry. We found that Uma is always 3 hours early to the sessions that she would be handling and this made us to hand over the keys to her. You can find that if you plan to attend one of her baking sessions. Vinita started her baking journey with Cupcakes & Cookies. 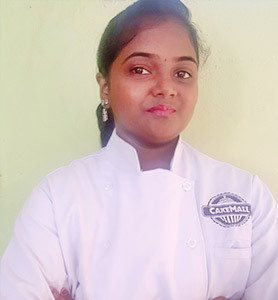 Being passionate about baking, Vinita attended many advanced baking courses and feels that she is moving in the right direction as she wants to make her career in the baking industry. She is pretty good in baking large batches and expert in various measuring techniques. If you ask her from where she had picked the skill from, she would claim that she is very good in Mathematics even before she came to know about the subject. A perfectionist to the core, Mary is a tough taskmaster. An Avid baker, Mary specializes in Cakes, Desserts & Frosting. Mary started baking at very young age and admits that she did test all her products with her family first. After gaining near perfection, she ventured out and learnt many new advanced techniques in baking. Her finishing touches are brilliant and being a good communicator, Mary explains clearly and slowly every detail involved in baking. Mary holds a Masters in Business Administration from LIBA (Loyola).Ask her the details about her young age baking and the tests that she did with her family that time,she would avoid that question for sure.